Which deep mind tool works better, meditation or hypnosis? How are they similar? How are they different? Here, we compare and contrast the two, resulting in a clearly defined winner. The Upside: Meditation's Benefits Are Limitless. Hypnosis? Nope. It began with a 2011 new year’s resolution to finally to get up off the couch, going for a light jog after work. Last month you completed your 6th marathon, beating your personal best record of 3 hours 56 minutes. This week, you begin training for a triathlon. Most people who set out to accomplish small things often go higher and farther than they ever imagined possible. Granted, most people who seek out hypnosis are not looking to colonize mars, create free energy, end world hunger, or save the planet. They simply want to kick a habit, heal some kind of trauma, or erase a limiting belief. They are correct, doing a few sessions of hypnosis will never lead to much other than small goals. Hypnosis will not help you fully quiet down the 50,000 thoughts per day that the human mind generates, moving from the hyperactive "monkey-mind" to the slow, deep thinking "ox-mind." Nor will it help you achieve true mindful awareness — where you become a true witness and detached observer of your thoughts. But meditation will. Hypnosis will not help you understand our deep interconnectivity, that we are all each expressions of the one great whole. Hypnosis doesn't help you see that we are all but grains of sand on the beach, each unique yet all part of something much, much bigger. Meditation makes you aware of this as well as other universal truths. Hypnosis will not help you lucid dream. No incredible, paradigm shattering experiences during your nightly shuteye. No powerful insights into your waking life, no conscious interactions with other thoughts forms. Meditation will help you master your dream cycle. Hypnosis will not put the universe in your sails, it will not help you achieve a state of flow, it will not help you attract and manifest abundance, nor will it open the door to your highest and best self. Meditation makes the quantum work for you. Hypnosis will not help you achieve the highest, most advanced states of consciousness — like those achieved by history's great spiritual leaders, deep thinkers and philosophers. Hypnosis will not help you reach enlightenment (no matter how it's defined), it will not help you self-actualize, nor will it help you become awakened. Meditation will. Hypnosis does not bring a forever ascending, always improving set of benefits. Meditation does. The thing is, hypnosis is a recent invention. It is the latest gadget. Meditation has been around since the dawn of man. Meditation has no competition, it is in a league of its own. It works, and always will. What if you had the opportunity to pick the collective brains of the world’s most successful people? How illuminating would that be? What would you discover? Could you find any golden nuggets, perhaps certain daily habits, rituals, or routines to mimic? The truth is, there are certain things successful people do that the rest of us don’t. On his incredibly popular, 100+ million download podcast, bestselling author and highly successful angel investor Tim Ferris (4 Hour Work Week) deconstructs the psyche of some of the world’s most successful people. His 200+ spell-binding interviews of powerful CEOs, top martial artists, Hollywood actors, successful bloggers, bestselling authors, famous media personalities, top military rank, esteemed artists, and gold medal olympic athletes — are incredibly illuminating. What did he uncover? Roughly 90% of these super successful folks had a daily practice of meditation! Tony Robbins, perhaps the world’s greatest motivational speaker, claimed that meditation has dramatically changed his life, with his morning "hour of power" routine. (Note: You don’t need an hour per day, 15-30 minutes works just fine). The 25th wealthiest man in the world ($16 billion), legendary investor Ray Dalio (Bridgewater Associates), claims to owe meditation for his incredible track record of success. Overwhelmed with the pressure from his newfound fame and rapidly growing movie career, in the early 80’s Arnold Schwarzenegger learned a powerful meditative technique which forever transformed his ability to deal with stress. Creator of the expansive Paul Mitchell hair product empire, billionaire John Paul DeJoria begins his day with only 5 minutes of meditation. Founder of Apple, now the worlds most valuable company at $630 billion — the late Steve Jobs stated that it was not until he developed his intuition and gut feelings through meditation that he was able to guide his companies (including Pixar) to the stratosphere of the business world. Jobs learned the meditative ropes on a now well-documented 1974 trip to India. Is it any wonder that many of the world’s top companies now offer meditation classes to their employees? Behemoths like Google, Apple, and Facebook? It is the powerful deep mind access, the creative idea generating, the sharper thinking, and the higher states of awareness that keep these successful people drinking from the meditative well, time and time again. Meditation makes people successful. Hypnosis? Probably not. In terms of scientific interest, how do meditation and hypnosis compare? Google Scholar, the online search engine for scientific research articles, provides some deep insight into the great debate. Since 2000, including citations, the keyword "meditation" returned 224,000 results. Under the same conditions, the keyword "hypnosis" returned only 46,600 results. With some quick and easy math, meditation is backed by about 5 times as many studies! What does this mean? While both mind practices have the scientific community enthralled — by orders of magnitude, meditation beats hypnosis. Meditation has vastly more scientific backing and credibility, plain and simple. Before undergoing hypnosis, there are some critical questions to consider. For starters, hypnosis is a largely unregulated industry. Looking for a highly experienced, well-qualified practitioner with a track-record of success? Good luck. While online reviews and personal referrals help, it’s still hit or miss. Moreover, it is quite common to visit a series of hypnotists before finding one you click with and trust. Of course, liking the person doesn’t mean that they can give the results you seek. How much will it cost? Pricing can be steep, with the average session in the neighborhood of $150. Insurance doesn’t cover hypnosis either, in case you were wondering. How many sessions are needed to bring any kind of meaningful behavioral change? While there are exceptions, if you want to quit smoking (or anything else), there is a process involved. There is no quick fix. Achieving your intended goal will not happen overnight. Multiple hypnosis sessions are the standard — let’s say a minimum of 5 visits to make a lasting dent in your behavior. At $150 a pop, not cheap. Of course, this is excluding follow-up sessions. You do the math. To prevent future engine break down, your Honda Civic needs the oil changed every 3,000 miles. Like your car, hypnosis requires a maintenance session every now and then to ensure your results stick. Everyone loves going to the mechanic, right? Another thing to consider, can you enter a hypnotic state? Are you of the certain percentage of people who are simply resistant to hypnosis, forever unable to access your deep mind? How many hypnotists are you willing to try, how many sessions are you willing to burn through to discover that you are indeed — hypnosis immune? To sum, if you are the right "type" of person under the guidance of the "right" hypnotist, have the patience for multiple sessions (perhaps life-long), and are blessed with abundant time and financial resources — you can certainly achieve great results from the practice. Luckily, there is a better way, it’s called meditation! A wonderful thing about meditation is that your can visit your deep mind whenever you like, becoming a master its inner workings. Session after session, you can achieve progressively higher levels of thought and ever deepening states of mind — where you have no habits, no fears, no addictions, no phobias, and no limits. This is meditation. Meditation is free and can be practiced anytime, anywhere. Unlike being dependent on the local repair-shop (hypnotist) to fix your car when it breaks down, meditation makes you the mechanic of your own mind. Like anti-virus software on your computer, the mindfulness achieved through meditation ensures your mental self-diagnostics are always online, effectively neutralizing any dysfunctional intruders (fear, anxiety, depression, addiction) before they reach the surface of your mind. Meditation puts you firmly in the driver seat of your mind. Hypnosis? Not so much. What if your hypnosis succeeds and you quit smoking? Great. But wait, now you eat twice as much as before, gaining two pounds a week. Is this what you wanted? Was your hypnosis really successful? How often do people who undergo hypnosis, soon after giving up the smokes or the bottle, channel their habits into a new medium? Best known as "cross addiction" or "substitute addiction," it is quite common to find yourself with a new monster to feed after slaying that dragon which (for so long) dictated every aspect of your life. To uncover the true reason behind your addictions, habits, fears, and limiting beliefs — a good hypnotist will regress your mind back to certain events (often traumatic) in your life. If done successfully, it certainly helps. What if your catalytic converter has a gaping hole, your tire tread is gone, your chassis is rusted, your timing belt needs replacing, your radiator is clogged, your transmission is grinding, and you have a blown head gasket? Will your hypnotist be able to find and repair everything? How many hypnotherapy sessions are needed to achieve full restoration? How many sessions are required to plant the self-actualizing seeds, to reach your highest and best self? Next week, you get a double beat-down — your wife files for divorce and you lose your job. Will the five hypnosis sessions you underwent in 2013 help you navigate the turbulent waters ahead? The point is that you need to have a way to regularly explore and eventually master the inner workings of your deep mind. With repetition. On your own. No dependence on a hypnotist. Then, what is the self-reliant, vastly superior alternative to hypnosis? Meditation! During meditation, your long forgotten memories bubble up to the surface, many of which are your past critical forks in the road which, knowingly or unknowingly, dramatically influence your current thoughts and behaviors. Often repressed, any good hypnotist would attempt to them draw out, with simple awareness being the "all in one" releasing agent, tonic, and elixir. Shining a light on your past brightens your future. Experience childhood trauma? Are you a heavy drinker? Do you harbor phobias? Not as successful as you should be? Meditation will help you get under the hood to find the real reason your check engine light is on. Meditation can with its simple yet powerful observation of the mind, melt the anxiety, lift the depression, master the fear, or balance any other dysfunctional emotion preventing you from spreading your wings. No hypnosis required. The Craftsman tool set of the mind, meditation enables you to not only self-diagnose and self-repair the laundry list of critical, life-shaping events from your past now affecting your present, but to also fix any inevitable future breakdown. Knowing that any roadblack in your path can easily be overcome is not only intoxicating but incredibly empowering. By going face to face with your past, meditation moves you into control of your future. Would you rather spend thousands of dollars on a hit or miss hypnotist, or would you rather learn meditation on your own and find a life-long companion to bring with you any time, any where? Some of meditation’s most powerful and far-reaching upgrades are physiological rather than mental, as dozens of medical journals would attest. (Tip: Not to toot our own horn but this website is a great place to learn about these benefits). Just to name a few, meditation has been proven to make certain areas of the brain bigger and stronger, like the "super smart" prefrontal cortex, the "happiness center" posterior cingulate, the "memory building" and "depression erasing" hippocampus, the emotionally intelligent temporo-parietal junction (TPJ), while quieting the "fear-center" amygdala. Meditation also boosts key brain and body chemicals like the "happiness bringing" serotonin, "runners high" endorphins, "addiction defeating" GABA, "deep sleep" melatonin, "fountain of youth" DHEA, "forever young" growth hormone, while lowering the "stress hormone" cortisol, just to name a few. Want more? Meditation also works to balance the left and right brain hemispheres, boosts brain cell production through a process called "neurogenesis", while synchronizing the brainwaves to highly advanced states of consciousness that scientists are just now beginning to wrap their heads around. Meditation has mesmerized the medical and scientific communities for decades, with new studies being published all the time. Hypnosis, not so much. The one knock hypnosis advocates have against meditation is that the practice has "no direct goal or focus." This is a myth. Meditation is not simply a place where you relax, empty your mind, or achieve "thoughtless peace." People who say this do not understand how the mind works, nor do they understand how meditation works. • Quiets the busy mind. • Makes you a witness to your thoughts and impulses instead of being controlled by them. • Uproots the true reasons behind your fears. • Melts the anxiety which leads to so many destructive patterns, coping mechanisms, habits, & behaviors. • Dramatically upgrades your body's stress response and relaxation response. • Totally disciplines the mind. • Is backed by thousands and thousands of studies. • Disentangles your thoughts from your feelings. • Transforms your physiological response to your thoughts. • Enables waking access to your super powerful subconscious & unconscious mind. • Is a highly pleasurable, wonderfully enjoyable experience. • Is an all in one, multi-purpose mental "swiss army knife." • An outlet. A way to unplug. A way to recharge. Your own personal reset button. • Builds at least 10 brain regions via neuroplasticity. • Boosts at least 7 brain & body chemicals. • Enables the highest states of human consciousness. • Gets your left and right brain hemispheres to work together. • Boosts your brain cell production (known as Neurogenesis). • Allows deep examination and quick release of any limiting belief. • Makes you more emotionally intelligent. • Is something you can do without the help of an outside party (hypnotist). That should cover all of the reasons to visit a hypnotist! Choosing meditation over hypnosis is really a no-brainer. How Do Meditation & Hypnosis Work? In that in-between twilight state, not quite asleep, not quite awake, have you ever paid attention to your level of thought? If you watch closely enough, you will notice the movie screen of your mind projecting an array of creative solutions, profound insights, deep thoughts, and (often bizarre) dream-like imagery. Very different from your waking awareness, like night and day. This level of consciousness is quite fleeting, closing the lid to our deep mind happens as soon as we get out of bed. Would you like to harness this incredible power? When it comes to the human mind, the proverbial iceberg metaphor works quite well. Your everyday, conscious level of thought is minuscule compared to what lies beneath the surface. While the German doctor and philosopher Ernst Platner is often credited with the now well known term "unconscious," great thinkers like Einstein, Freud, Jung, Shakespeare, and Nietzsche have always known of the highly complex, multi-leveled hierarchy of the human mind. These great thinkers went beyond simple awareness of these great mind layers. Some of them would regularly dive beneath the surface, harnessing the volcanic power laying dormant within their subconscious and unconscious, leveraging their deep mind to create their ageless, world-transforming bodies of work. For example, when Albert Einstein was working on the modern theory of relativity, reports claimed that he had a routine for accessing his subconscious mind. He would lay on the couch, eyes closed, in a trance-like state — waiting for inspirational flashes to bubble to the surface of his mind, writing everything down on paper upon waking. Don’t want to be a genius? That’s ok. Learning to access your deep mind layers will yield many more benefits. The emotional baggage we all carry resides in these deep mind layers. Your habits, your fears, your addictions, and your limiting beliefs are all rooted in your subconscious and unconscious mind — driving your behavior in so many ways. Then, how do we untangle our mental knots, master our fears, disable our addictions, break through limiting beliefs, while awakening our own "inner-Einstein" as a result? Perhaps the only two known methods, both meditation and hypnosis allow access to the vast ocean of power contained within your subconscious & unconscious mind. Note: Medition is a much more powerful, time-tested method of accessing your deep mind layers. We will dive more into this in the following sections. 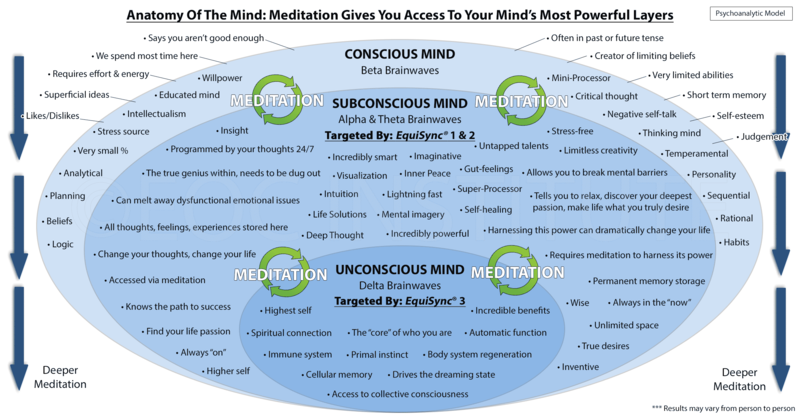 For now, we recommend using the infographic below to better understand the incredible array of benefits associated with your conscious, subconscious, and unconscious mind layers. 1. Choose Goal: Click on the link below for your goal. 2. Select Affirmations That Resonate With You: After opening, you will see a list of positive affirmations that we have curated toward your goal. While they are good to go as-is, please choose only those with which you resonate. 3. Record Spoken Affirmations: Use a free program like "Audacity" to record yourself speaking the chosen affirmations. Most computers nowadays have built in audio recorders. Mac devices have "Quicktime", windows computers have "Windows Media Player." Audacity works great on all devices and is free. 4. Speak With Conviction:Believing leads to conceiving, speak with authority! We recommend practicing before making your final recording. There is nothing wrong with re-recording (in the future) to match your growing belief. 5. Playback Affirmations: Play your recorded affirmations during meditation at a lower, barely audible volume level. You don’t need to understand the words, they should be at a "whisper" volume. Doing this bypasses the conscious mind, removing any resistance you have to the words being spoken. The best volume for the subconscious is "barely audible". 6. Enter Meditation: With your headphones playing your recorded affirmations, enter meditation. Don’t know how? Here are great meditation instructions. 7. Optional: Use EquiSync®: Use EquiSync brainwave audio technology to multiply your results. Specifically designed to help you achieve a deep, super beneficial state of meditation much faster than the traditional route. The brainwave technology will help to get the affirmations deeply embedded. Learn more here. 8. Optional: Play EquiSync Alongside Your Affirmations. If following step 7: From your computer, simultaneously play EquiSync alongside your recorded affirmations. We recommend using two different audio players, such as iTunes/Quickplayer/VLC Player/Windows Media Player, etc. Playback the affirmations at a lower volume level than Equisync. 9. Optional: Combine Into 1 Recording. If following step 7: If you are technically inclined, you can combine the recordings into one (a bit more complicated). If you go this route, make sure you record in a lossless form, like WAV, as the brainwave technology is highly sensitive to quality loss and degradation. Audacity has this option when exporting. 10. Enjoy! This hack is a very powerful and super effective way to merge the benefits of hypnosis with meditation!